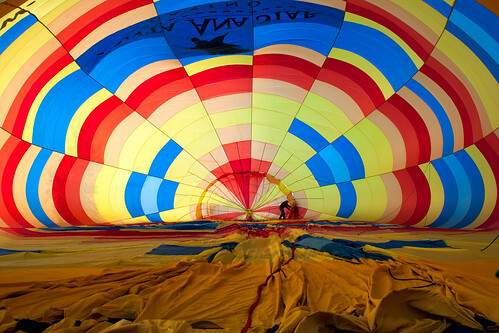 Balloon Inflating, a photo by Ingrid Truemper on Flickr. It's Sunday night and not only is it the end of the weekend but it's the end of half term too. I've had such a lovely (and busy) week and as I'd hoped it was lovely spending so much time with my daughter again. I'm going to miss her tomorrow and I my son is going to miss his big sister too. I also can't believe how quickly I got used to not having to set the alarm again. Tomorrow morning is going to be painful. Here is a photo which just made me think "Wow". Hot air balloons are so huge and this photo really shows off the size. It's a really colourful shot too and I do love a bit of colour - especially on a rainy Sunday evening. I so hope the rain goes away before tomorrow morning's school run!